On this project we were tasked with updating our client's pied a terre overlooking Rittenhouse Square. Built in 1980, the apartment needed a complete overhaul. Because it would need to accommodate their large family, designer Mona Ross Berman had to work some space planning magic. Architect Mark Monteith helped out with submittals to the condo board. We gutted the kitchen, removed crown molding, repainted traditional oak parquet floors in sleek black, completely renovated both bathrooms, and added a variety of lighting options to lighten up a previously dark apartment. 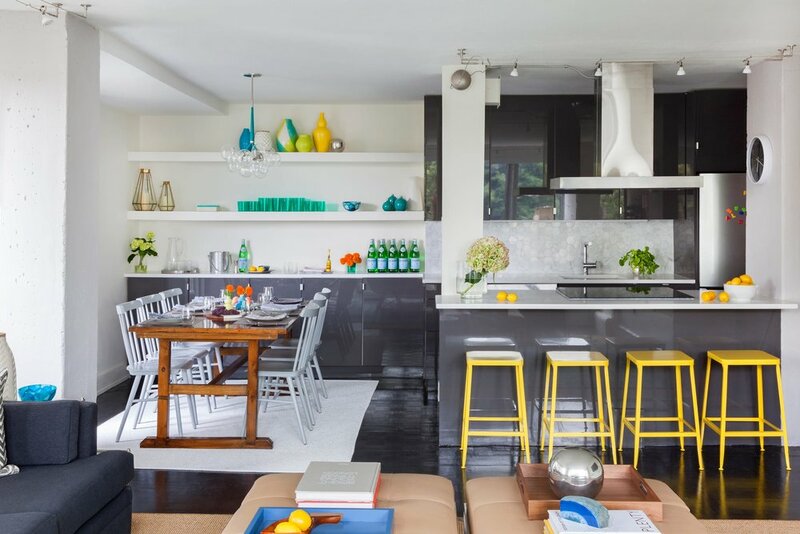 MRB Interiors brought in color and a modern aesthetic that brightened the space up even more. Working in high rises presents a unique set of challenges compared even to the rowhouses of Philadelphia where neighbors literally share walls. In a condo building, there are neighbors everywhere. Access is tricky, and in addition to city code requirements, buildings have their own standards that have to be met. We have the experience to navigate this process so that the project stays on schedule. "Kenny from Buckminister Green was the general contractor for our apartment in Rittenhouse Square. From the beginning, he was very easy to work with and had great ideas on how to use the space in our apartment. The apartment was completely gutted and Kenny helped us every step of the way. For us, what impressed us the most was not only his construction and design skills, but his very effective communication. He sent us weekly status reports on Fridays which really made the 6 month project that much easier. He was very accessible via phone and e-mail and all of his sub-contractors that he hired went above and beyond to do a great job. The finished state is quite impressive and we really owe a lot to Kenny and his team for making the whole process seamless and easy. We keep teasing that we need to find another apartment so we can hire him again."